As I wrote in my post on Milton Friedman’s “Money Mischief” yesterday I have asked a number of “monetary thinkers” to make a list of around five (or so) books on monetary matters they would recommend for students of economics. I had initially just thought I would make a list of books based on the survey, but it turns out that there is a lot more material than I really had thought about. So I will instead do a number of posts on the book recommendations. Other than studying money supply numbers I early on found the library at the economics department at the University of Copenhagen. I read everything I could find by and about Milton Friedman and then went on to read other monetarists – such as Karl Brunner and Allan Meltzer. It was also at that time I first read articles by Scott Sumner and Bob Hetzel. It was not everything in Monetarist Perspectives, which impressed me. In fact I was somewhat upset by David’s discussion of “The Case for Gradualism” (Chapther 5). I wanted shock therapy to end inflation. I reread the Chapter last year I must say I had a very hard time seeing what my problem had been back in the early 1990s. The reason why reread Monetarist Perspectives is that I was able to get my own copy last year. I got a used copy. In fact my copy used to belong to University of California but was withdrawn from the library there and now it is on my table while I am writing this. 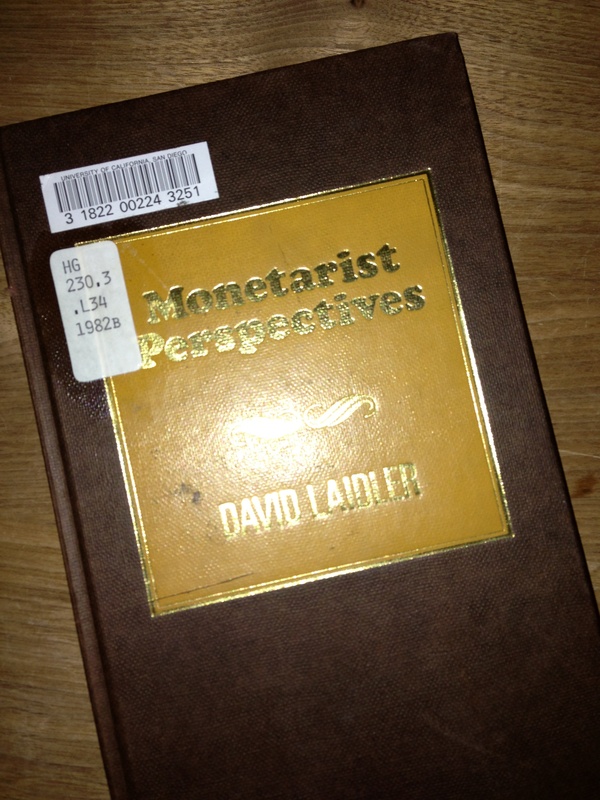 Monetarist Perspectives is not the only book written by David Laidler I own. 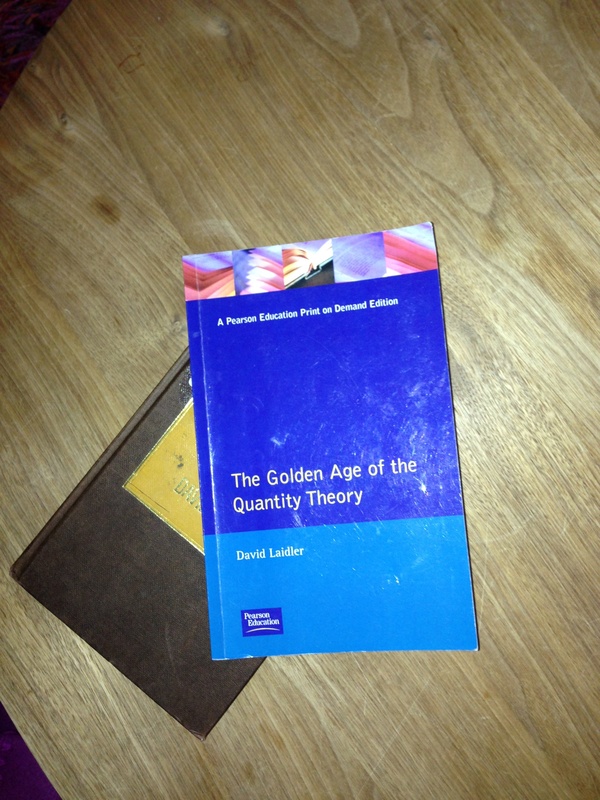 And it is not even my favourite Laidler book – that is instead “The Golden Age of the Quantity Theory”. David Laidler is hence one of the biggest experts on monetary thinking in the world and it was therefore natural that I asked David for his contribution to my book survey. And I am very happy that David kindly has provided me with five books that he would recommend to students of monetary thinking. The common theme here is that the monetary economy performs the allocative and distributive functions usually attributed to the “market” by general equilibrium theory, that it is capable of performing these well, that success in this regard should nevertheless not be taken for granted, and that the way in which issues related to these matters appear evolves over time as monetary institutions evolve in the face of challenges presented by their own successes and failures. 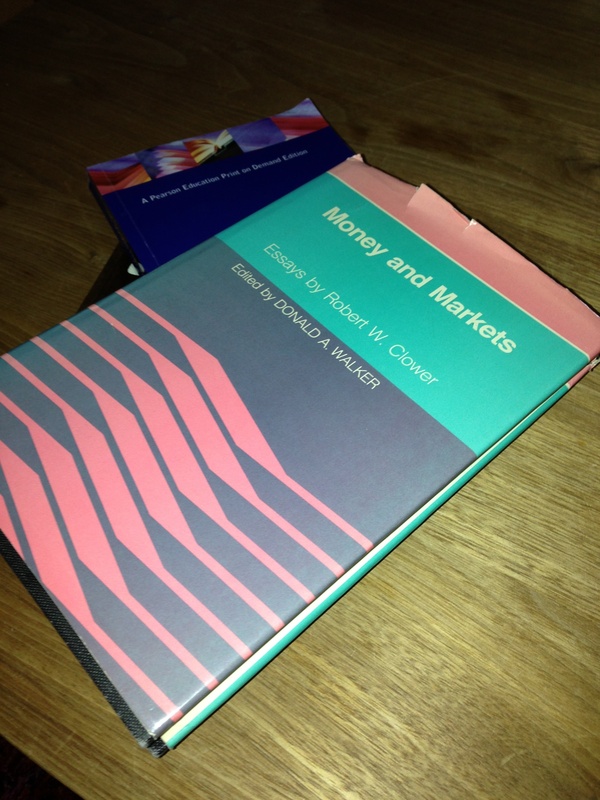 When I went through David’s list and his arguments for choosing these books I actually came to think of another book and that is Robert Clower’s “Money and Markets”. The reason I mention Clower is that I think he has been a particular inspiration for particularly Canadian monetarists like Nick Rowe who was very much brought up in a Laidlerian tradition of monetarism. Nick and David are of course both British-Canadian. And finally as Kurt Schuler notes many of the books on money published prior to 1922 are now available for free online. Particularly the Ludwig von Mises Institute has done a great job in making classics available online – including the first book on David’s list Jevon’s “Money and the Mechanism of Exchange “. Cheers David and start reading all of you! George, you are right, but for once I tried to say something nice about LvMI – I often forget to do that. By the way my readers should look forward to my post on your book recommendations. It will be out in the next couple of days. Have you ever heard of Monetary Theory by Alan A. Rabin? It sounds very market monetarist friendly. Yes, I have read Rabin’s book. It is correct that is covers topics that are very Market Monetarist in nature. However, it is notable that it is said in the introduction that the book was co-authored by Leland Yeager, but that Yeager withdrew his name. It doesn’t say why and I don’t know why. Furthermore, if I where to have the same kind of insight I would rather read the source itself. Steve’s book is the closest to a textbook on Monetary Disequilibrium theory you get.